Amanda Bate is the founder of Bate Consulting, a college admissions & career consulting firm. Amanda also co-founded TCKchat, an online Twitter discussion on third culture kid issues, and launching TheBlackExpat.com in late 2015, which documents the experiences of third culture kids & expats through a black lens. I was born in the US and when I was 10, my parents wanted to return to West Africa – Yaoundé in Cameroon. I then went through a variety of educational experiences including home schooling, local schooling (where I was seen as the American kid), an American international school and then ultimately graduating from an international missionary high school. I have been aware of and wrestled with identity as young as elementary school- before I had even made my first move, as I didn’t share the same passport with my parents. By then I was already in this mode of code switching; being my most American self at school but coming home and living in a world centered around my Cameroonian identity. I look at TCK as less of as a label and more as an experience. It is about understanding and giving voice to the life experiences and opportunities that have happened in your childhood. Do you identify as being a TCK (why/why not)? TCKs can be marked by at least one international move and also being in an environment where you are impacted by people that come in and out of your life as a result of moves. I definitely identify with that because I’ve moved and people have moved around me. Do TCKs share a common set of values and beliefs? It is sometimes hard for me to articulate whether TCKs have a common set of values. There are definitely things we share – on a superficial level; they have a love for travel, a love for international affairs – at the very least at what’s happening in the parts of the world that they lived in. TCKs often are very adaptable and code switch well- they know how to go in and out of environments, navigate dominant culture but they may be perceptive of what’s happening in a non dominant culture because they are used to knowing what it is like to be different and can be sensitive to that. There is a sense of flexibility and a desire of wanting to have an impact on the social good... coming from a variety of places, their own experiences, the work of their parents, having a passion is a huge marker of the TCK identity. However this is all very general. TCKs are different, no TCK has had the same experience – even those coming from the same families have had unique experiences from their siblings so in that regard, there are a lot of nuances to the experience. For me, my experience is also clouded by what is means to be a TCK with a black identity and who sees themselves as a black woman, how they see themselves as a black woman in the world… there are places where I can see my values are radically different from others because of my experience. How can TCKs/CCKs better externalise their unique experiences and characteristics with the world? TCKs should take their experiences and put it out in the world. Being adaptable and flexible is needed everywhere – educational, profession and it is really something I think can be at the forefront of challenging problems in regional and national communities. TCKs are often wiling to think outside of the box because they’ve lived outside of the box. TCKs can transfer their cultural experiences into a region that has never even considered their point of view. They should not be afraid to use their identity. 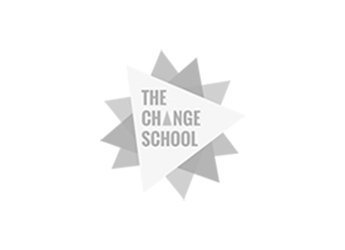 Change-makers are often truly change makers because they’ve applied experiences of living across cultures. There are TCKs doing all kinds of things, taking pieces of their identity and putting it out there for the world to see. 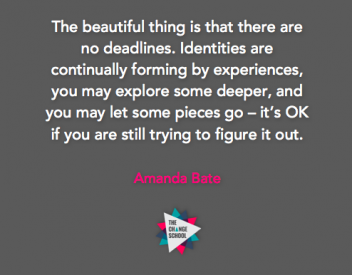 The beautiful thing is that there are no deadlines to figuring out your TCK identity. Identities are continually forming by experiences, you may explore some deeper, and you may let some pieces go – it is OK if you are still trying to figure it out. Be comfortable and present in who you are, allow yourself to feel things. A lot of TCKs are future oriented – a nature of being in a transient community. Be OK in learning that it may take a while to figure out how you see yourself – don’t let anyone tell you that you have to be something you are not comfortable being.